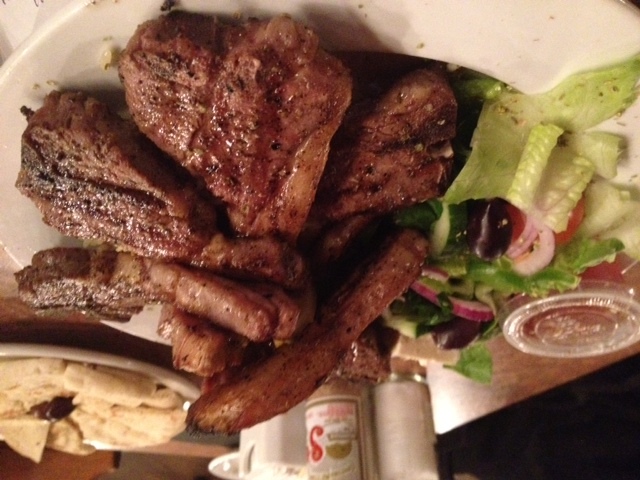 CFN – I love Lamb; especially when it’s done well and for some reason Greek food seems to take Lamb to special heights I’ve rarely seen matched. Coming back from Valleyfield last week my dining companion suggested Dimitri’s Restaurant in Summerstown Ontario. 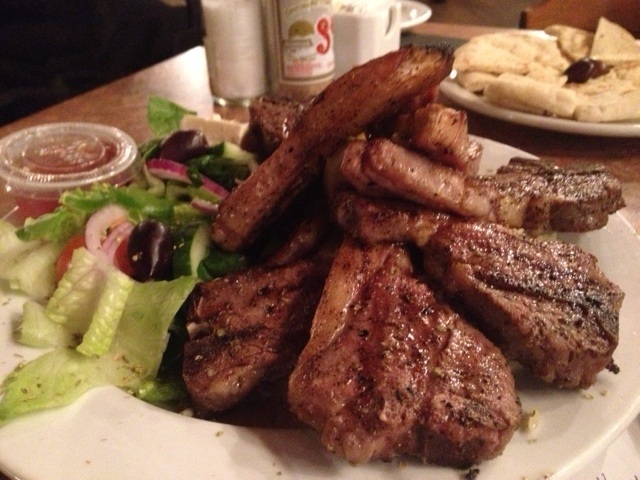 Mostly known as a pretty village along scenic Highway 2 and the St. Lawrence River that boasts one of the largest patios in the region; Dimitri’s features some very fresh and well prepared authentic Greek cuisine. I also love seafood. 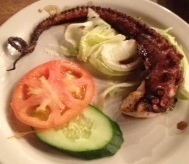 And really well seasoned grilled Octopus as my appetizer! What I like about the menu at Dimitri’s is that the appetizers are priced well enough that they encouraged me to try a few more than I normally would and I was not disappointed. I sampled a lot of dishes with interesting flavours, but again it was the freshness and quality that stood out. The service was amazing that night in spite of not having a reservation. Dimitri himself found us a little table and helped suggest what to try while his delightful wife mixed a drink for us to enjoy with our meal. My dining companion in fact was not partial to Lamb, but she herself admitted it was excellent! We finished our meal with a shared Baklava with chocolate over it that was prepared with a lot of love and surprised that our feast for two including drinks was still under $75! Dimitri’s is open Thursday to Sunday in the Winter and serve Breakfast on weekends. 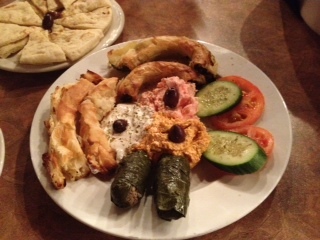 Besides the traditional Greek cuisine they also offer most restaurant faves from Pizza to Poutine. You can visit them at 19274 County Road 2 in Summerstown, Ontario – K0C 2E0 for those of you using a GPS! Your party of 3 was accomodated at a table for 8 on the proviso that you would need to move if it became necesssry. If we had know that your ego was that BIG we would not have mentioned it. We value you all of our customers very much and we are sorry that we will never have you grace our halls again here at Dimitri’s…….ever. The staff was so nice, the food very good, the prices ok too and the view, the terrace on the St-Lawrence, the decoration, everything is nice, beautiful and good! 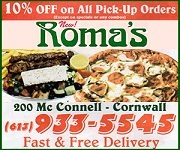 Thank you, it’s so great to have a place like this in the area! I enjoyed a great meal a few weeks ago with my hubbie. The server was excellent & we even had the pleasure of meeting the owners, who bye the bye were very nice. We plan to go back this w/e & hope to sit outside. Yes, hopefully they’ll advertise on CFN again soon. I told the owners we choose their restaurant bc of their AD on CFN…. This restaurant is a five star dinning in my book….the food is really really good, the service was friendly and the terrace was awesome….I went earlier to get the road to get there by boat, the owner (wife) came out to help me and later that day we went to eat with some friends by boat….the road to get there by boat is very nice…..we got some help to park as well….I’ve been dreaming of those calmar….so tasty….we will go back very soon, if the nice weather can come back….. Went with my spouse last week. Great service, great people. Such a nice looking place too! It was just a bit too windy to enjoy the patio but we can fix that next time we go. I can only imagine how awesome that patio looks at night. They definitely made our list!! Found out about your restaurant thru a new neighbor. I live in Brockville ON and the drive (about 1hr/20 mins) was well worth it.. Enjoyed it so much that I invited some friends ( who are in from Calgary) to join me there for lunch next week. Had FISH the last time but am going for the ARNI this time. You NEVER seat someone and then on the provision if a bigger group comes in you will have to move..VERY UNPROFESSIONAL !! The river view is beautiful but the restaurant is small and cramped..Food is ok but We wouldn’t go back. Maybe the restaurant should expand to downstairs too. Been a regular since they re-opened. Always great food & service. Worth the ride to get there. I’ve been going there on a regular basis since Dimitri’s Opened..The place is beautiful, love how they kept the lovely décor, clean, love the décor!!! The food is great!!! Service is absolutety awesome, which keeps me going back..Great smiles! !Always look forward to my visits!! One more thing…Keep up the great work!! !